Jon Williams is a clinical psychologist and freelance writer. He has performed, presented and published research on a variety of psychological and physical health issues. Legend has it that Henry VIII was so smitten with a spit-roasted double sirloin of beef that he dubbed it Sir Loin, the Baron of Beef. In England, the large joint of beef that included the loins and both legs acquired the moniker of baron of beef. 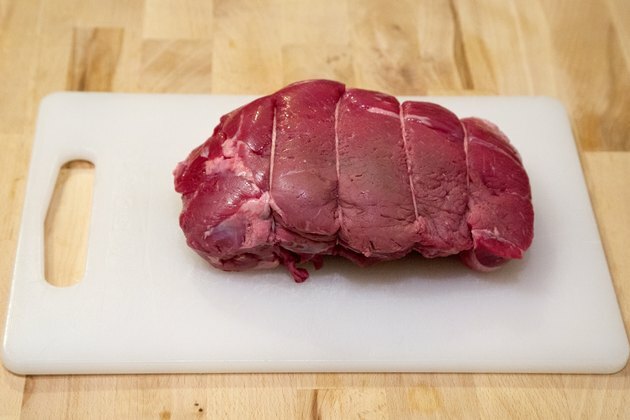 In the United States, however, baron of beef less precisely refers to large cuts of beef from the hindquarter suited to braising or roasting, including steamship round, top round, inside round and bottom round. Take the roast out of the fridge an hour before cooking and let it warm to room temperature. Preheat the oven to 250 degrees Fahrenheit. This will heat the roast slowly, allowing the interior to cook without drying out the outer layers. 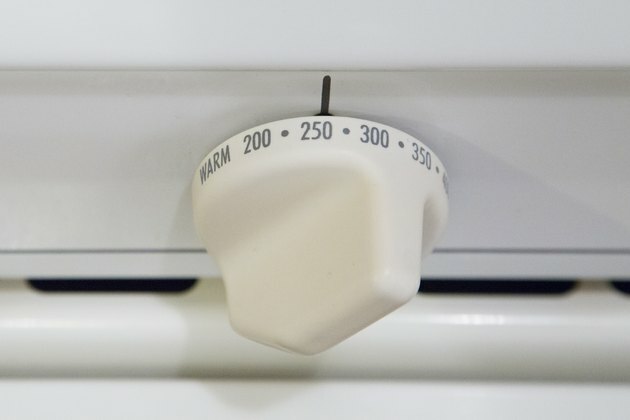 Place the oven rack in the lower middle position. 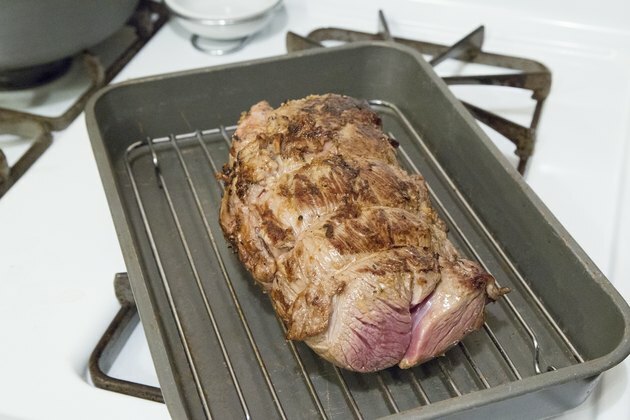 Pat the roast dry with paper towels. This improves the browning process. 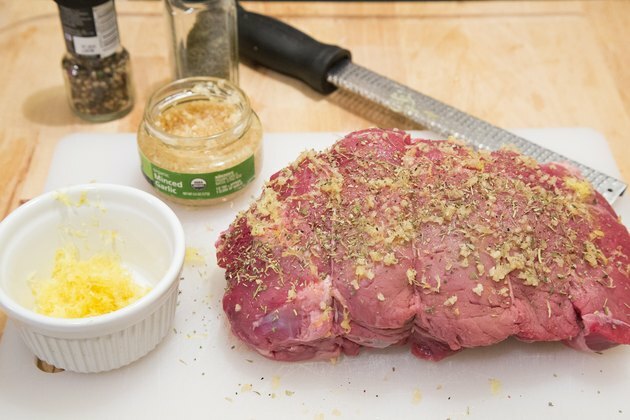 Massage spices into the roast, such as lemon peel, crushed garlic, parsley and black pepper. Hold off on the salt until after it has been roasted. 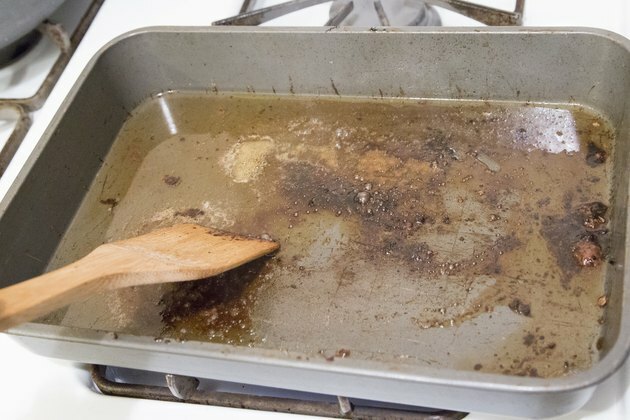 Rub the surface with oil right before cooking. Preheat a cast iron skillet or a heavy pan that doesn't have a nonstick surface until it is hot enough to cause a drop of water to sizzle. Spread 1 tbsp. of oil in the skillet and heat it until it begins to smoke. Sear each side of the roast for 1 1/2 to two minutes. Avoid puncturing the roast when you turn it as this causes the roast to lose juice. 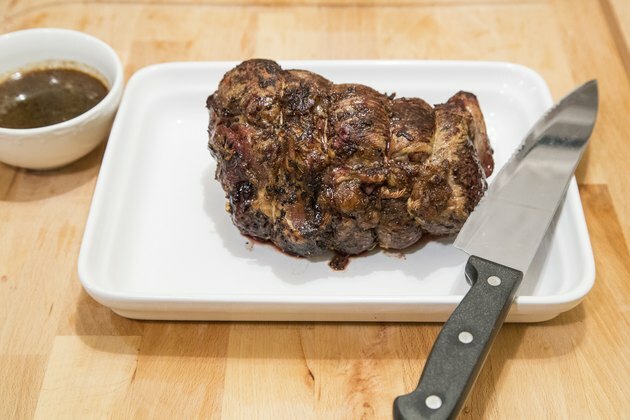 Place the roast with the fat side up on a wire rack in the middle of a roasting pan. Cook the roast uncovered for about 25 minutes per pound. Check the roast for doneness about an hour before the expected end time. Stick an instant-read thermometer into the middle of the round, away from any bone. 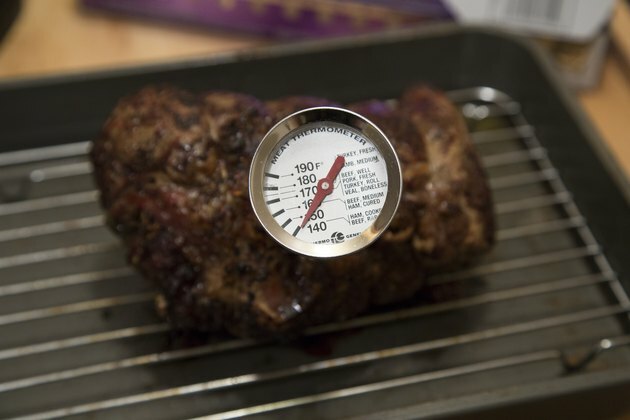 Cook the roast until the thermometer reaches 130 degrees Fahrenheit for medium rare or 140 degrees for medium. Baron of beef roasts are most tender when cooked to medium rare. 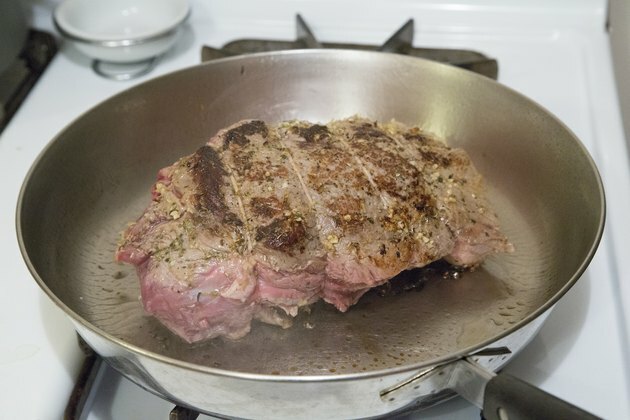 When you cook the meat to medium and beyond, the proteins coil more tightly, which squeezes out juices and makes the meat tougher. Transfer the baron of beef to a plate. 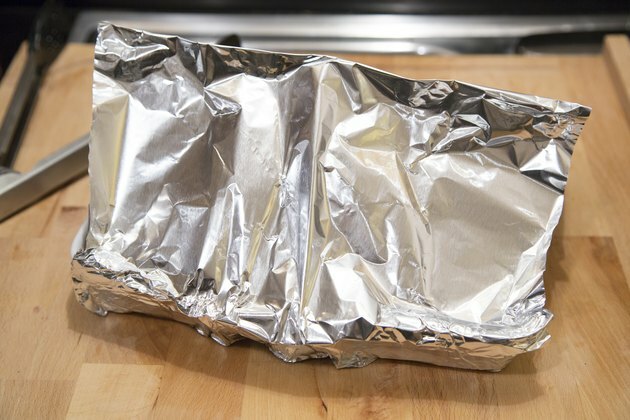 Tent it with foil and let it rest for 15 minutes. The protein coils relax, tenderizing the meat and allowing the juices to redistribute to the outer layers. The roast also reabsorbs some of the juices that leaked out while it rested. Deglaze the roasting pan, if you want to make some sauce. Heat the pan on the stove top. Add 1/4 to 1/2 cup of broth or red wine, stirring constantly and scraping the bottom of the pan to loosen cooked-on drippings. Bring the sauce to a gentle boil. If you wish to thicken the sauce, slowly stir in a mixture of equal parts cornstarch and water until the sauce reaches the consistency you want.